Discussion in 'Map Factory' started by NovaSilisko, Sep 12, 2009. Nova's OTHER map. Swampy swamp payload. Single stage, 3 points. Those screenshots look very pretty already. Very good mix of swamp theme and industrial. If I had to criticise it I would say that in parts it seems too linear and flat. The final part B->C has a good amount of height variation. I would like to see the first part more like that. Also the back tunnel from A->B seems too long, and far from the action. Maybe you would consider putting a room in there to break it up. (Behind the blue arrow in pic 3 is where I'm talking about). Also in pic 3 you can jump from the stump to the ledge, but you can't get up on the sign. 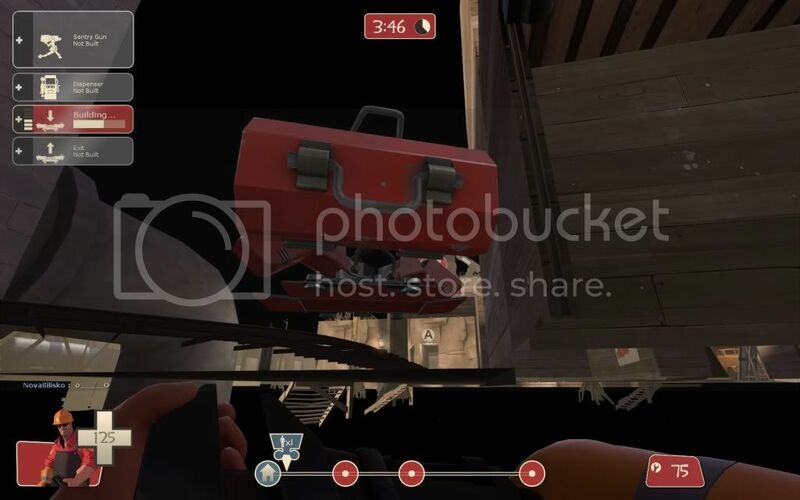 This played enjoyably despite.. my [ame=http://forums.tf2maps.net/showpost.php?p=103706&postcount=26]model issue[/ame]. But, i think the beginning and the end, can, and should, be much more epic. 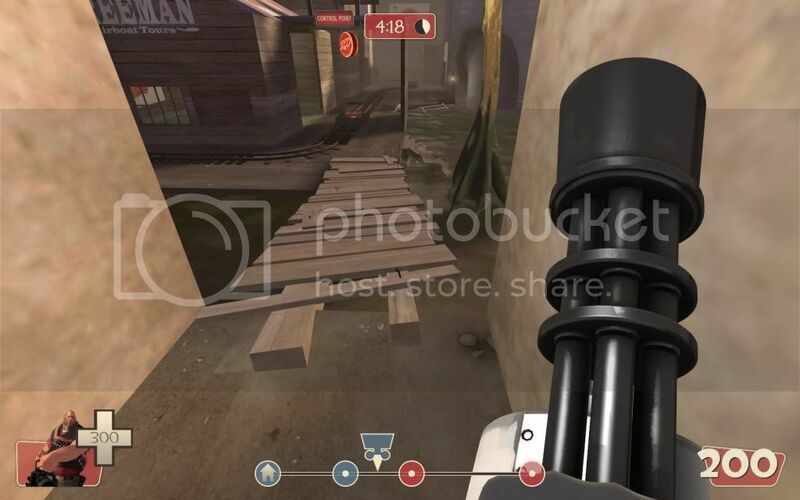 Crap I had a super long post written out and then tf2maps.net eated it. Anger. Point A is okay, but the one way door should be out of the LoS of that long track way. The upper area behind point A should be expanded, as right now it's not really great for battles. I would expand it, add a small balcony there, and maybe add some crates for spies to be able to sneakily get up to those areas. Then around that corner to B you have a fence thingie which is too close to the track. A huge pet peeve of mind is when things are placed too close to the cart that prevent movement around the cart - I think there should always be enough space for people to move around the cart. The fence should be pushed back a bit. The tree that's right there should be removed. It ruins the flow of the area by hindering what people can see. It is highly annoying, and is by far the worst area in the map. Removing that tree completely is recommended. The roofs are a good addition, but I think you might want to raise the roofs of the surrounding buildings or otherwise mark them so players know they shouldn't go up there. I'm sure you plan on doing this, but it is somewhat confusing and the area would read better overall for players. Point B should be expanded further into the swamp and the roof and supporting wall should be removed. It feels much too small imo, and pushing it out a little further is a good way to provide a more satisfying combat area. - The back area by the oil tanks is unnecessary and doesn't add anything. It takes the battle too far from the tracks, Red doesn't need another way to get behind Blue and Blue shouldn't go past the Red spawn. This area should be removed or moved to the other side. - Blue has no alternate way to get behind the Grinder area. My suggestion is to make a small back path from the forward spawn to behind the Grinder, somewhere near the fence. You might also want to open it up with an additional path to behind the final track turn, but I'll talk more about that when I talk about the final point. The final point needs to be expanded a LOT. It's much too cramped and will get very spammy very quickly. Defensive snipers are also almost untouchable here, since they have a huge LoS, and no one can really get to them. Something like that might do it pretty well. If you combine that with the alternate route from B to C then you have a way for Blue to move through the buildings to get past the sniper LoS into this flanking area. Opening it up will add a lot to it, and won't feel like such a brute force "Spam stuff until we win" kind of area which can ruin a lot of maps. I think if you make those changes the map will flow a lot better than it does now. Any feedback from yesterday's test? This feedback isn't based from the test, but rather just judging-by-the-screenshots. As others have mentioned, I agree with the fact that it does look a bit linear and open in some places. I would just look for some creative spots for houses and rocks providing cover, and I think you have a nice map that plays well. Don't just take my opinion though, I can only describe from the screenshots. I think you need to put another med/large ammo pack near the very start so red engineers can set up, there is currently only a small one which isn't enough. The last area is a bit confusing at first witha few different routes that red can take, need to probably give a bit more signage and maybe cutback on flanking opputunities. I also don't like the water pit things near the end that are annoying to get out of. Another issue was with the red forward spawn, even after it had been disabled youcould still open the door. Maybe put a teleport to the other spawn that activates on capture and an output that locks the door as well. 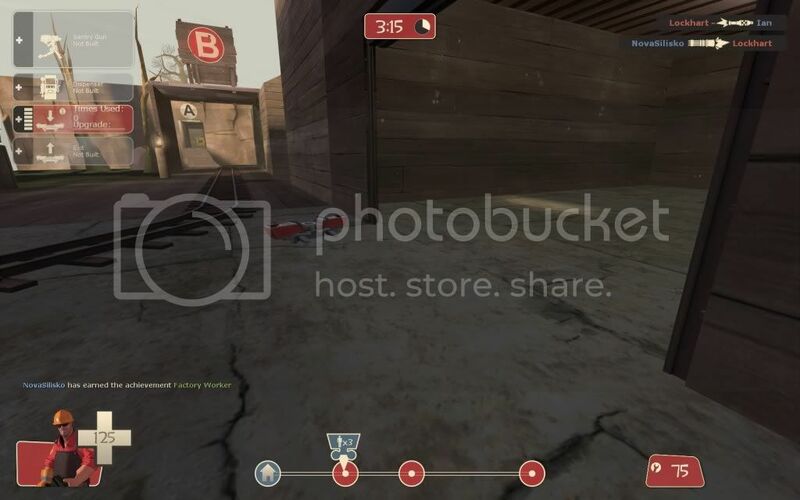 One last thing, thsi little tunnel is maybe a bit OP as a sentry position for red, and that boardwalk thing I'm facing needs player clipping so I dont get stuck all the time. The "toll-booth" gate that opens when the second point is captured should be removed. As a defending medic, I was trying to retreat beyond it after my team had been wiped. I was essentially trapped in the alley, completed exposed to the attacking team, until the gate opened. I played a5 last night, and I think almost every change is an improvement. I like the new building between spawn and point A, but it seems as if you should be able to get to the clipped half of the roof. I don't see why you can't just raise that half up a lot, to make it a little clearer. I think the only thing I disliked in this version was the bend from A to B. Its very much a choke, and imo B is already very easy to defend with the height advantages all along that route. I think you could move the truck somewhere else, or push it into the wall a little bit (like make a small alcove there for it to fit into) because it's difficult to push past that corner. I personally would like it if that whole bend was wider in general, but that's just me. Mind you, the team was on got rolled on defense, and the enemy team seemed to have no problem pushing past that point, and I wish I could remember team configurations, but I can't. I like the direction everything else is moving in though.